I’ve always loved a good pound cake. From sour cream to cream cheese to lemon to caramel, I love them all. There’s just something about the simplicity of a perfectly executed cake, but it’s an art. There are so many variables that can affect the end product. 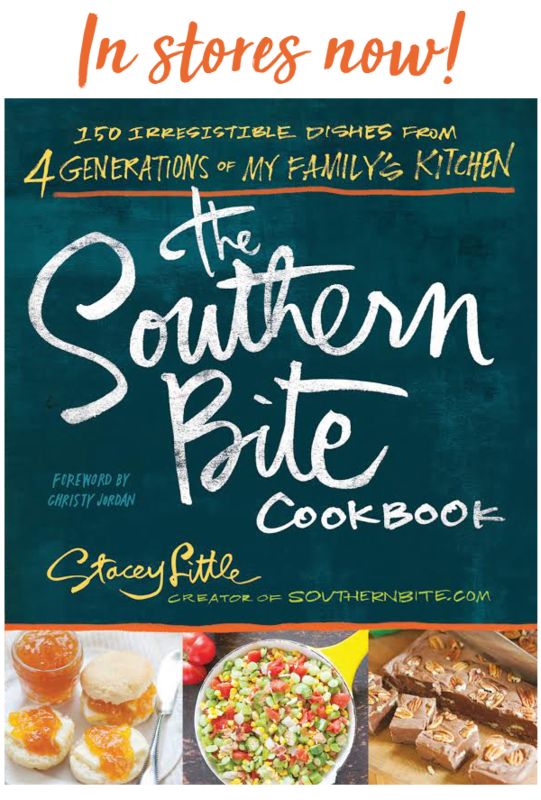 One of my favorite recipes is from one of my favorite people – the sweetest lady named Linda Studdard. She was one of my teachers and was one of those people that unknowingly had a profound effect on my development and life in general. In the early 90s, she introduced us to her recipe for a Cold Oven Pound Cake. If I remember correctly, dad had worked on her car and when she came to pick it up, she brought us a cake. It makes sense, because dad was always doing odd jobs on the evening and weekends to make ends meet and was good about helping folks out. I can still see her walking up the hill in front of the house with that aluminum-foil-wrapped cake. It was perfect. Dense and moist, but somehow still light and fluffy with the perfect flavor. But let’s be real, the crust on the pound cake is really the star. That crunchy exterior is just my favorite. If I don’t watch myself, I’ll end up picking one whole side of the top crust off. But I supposed the best part about that is once you turn the cake over on a platter, no one will know about your indiscretion. 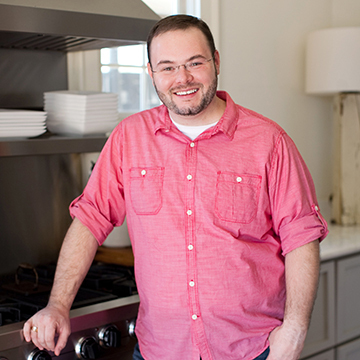 When I was writing my cookbook, I got an email from Mrs. Studdard that included her recipe for her delicious cake. It was a highlight for me to be able to include such a special recipe and share it with the world. Now, apparently there’s lots of debate in the food world about this whole idea of starting a pound cake in a cold oven. I’ve seen quite a few recipes out there that use that method. And since I’m no food scientist, I can’t really tell you why it works. But I can tell you that is does work. And sometimes when things work, we just leave them alone. Ya feeling me here? 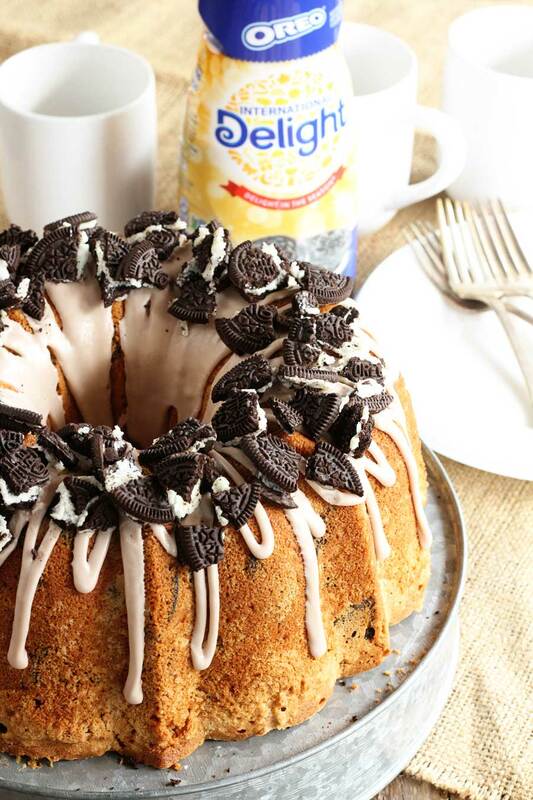 When my friends over at International Delight asked me to create a pound cake recipe using their new OREO flavored creamer, I knew exactly where to start. I opened my cookbook to the page with her recipe and got to work. 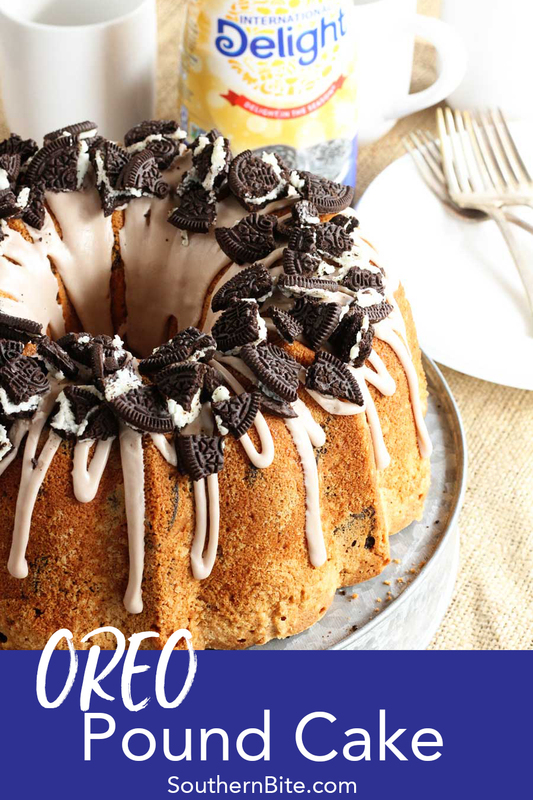 Y’all have heard me go on about my love for all things OREO, so putting two of my favorite things together just seemed like the perfect idea. And boy was it ever!!! 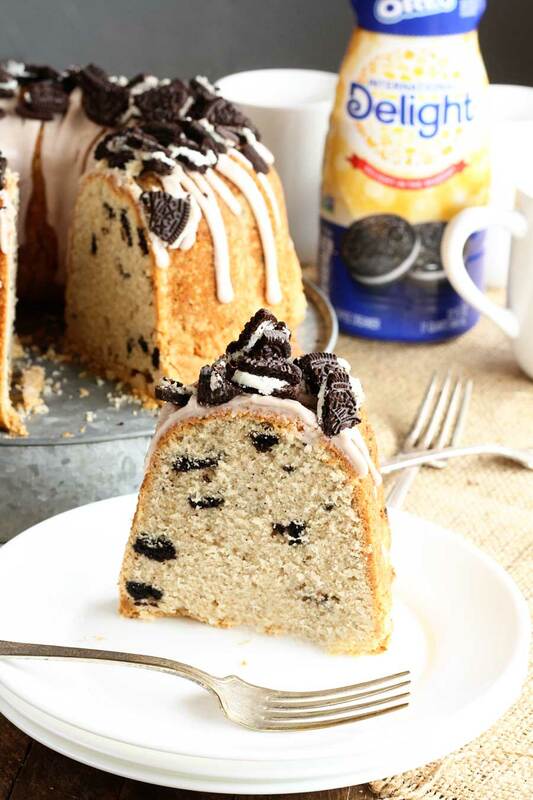 This OREO Pound Cake is phenomenal. 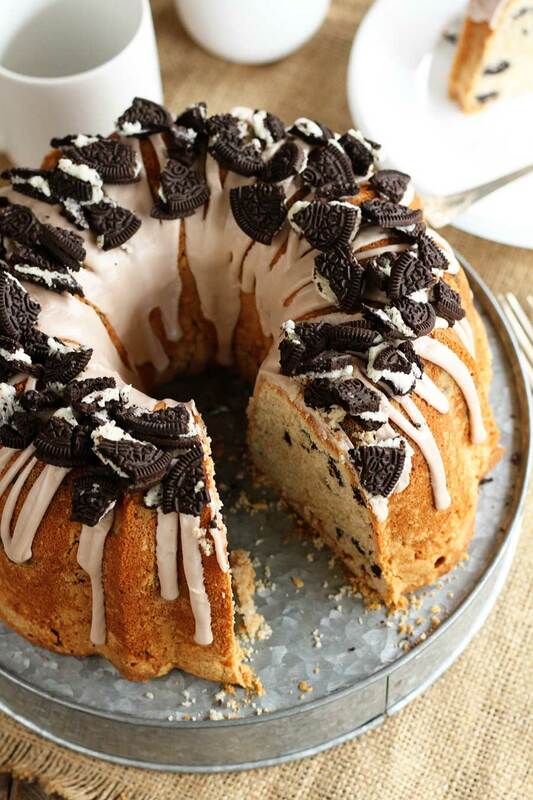 It’s got the same great texture found in Mrs. Linda’s cake but it’s packed with OREO flavor from the creamer and then studded with bits of crushed OREO cookies. To top it all off, I made a drizzle with the same creamer and sprinkled the top with more crushed OREO cookies. It’s gotten rave reviews from everyone who’s tried it. Outside of the cold oven method, there are a few things I think you might want to keep in mind. Start with ingredients that are room temperature. Let your butter and eggs sit on the counter for a few hours so they’re nice and soft. Room temperature ingredients combine more easily and more thoroughly and will produce a more even cake with a lighter texture. Yes, you really do need to cream the butter, shortening, and sugar together for 5 whole minutes. Set a timer. Yes it’s time consuming, but it’s worth it. Be sure to scrape down the sides of the bowl periodically if you’re using a stand mixer. I love the convenience of my stand mixer, but there will always be a layer of stuff that just doesn’t get mixed in around the edges of the bowl. Like the recipe says, alternate the flour and liquid additions so that you get an even batter. It takes a little more time, but again, it’s worth it. Just follow the recipe. This cake is GREAT right out of the oven, but I find that giving a pound cake a day to rest improves the flavor and texture. Just cover it and store it at room temperature. DO NOT preheat the oven. Grease and flour a Bundt pan. Using a hand mixer or stand mixer, cream together the butter, shortening, and sugar for 5 minutes. Add the eggs one at a time, mixing thoroughly after each egg. Add the flour and creamer alternately, beginning with 1 cup of flour, then 1/2 cup of creamer, 1 cup of flour, 1/2 cup of creamer, then 1 cup of flour. Beat well after each addition. Scrape down the sides of the mixing bowl and mix again. Add the almond and vanilla extracts, and mix well. Fold in the broken OREO cookies. 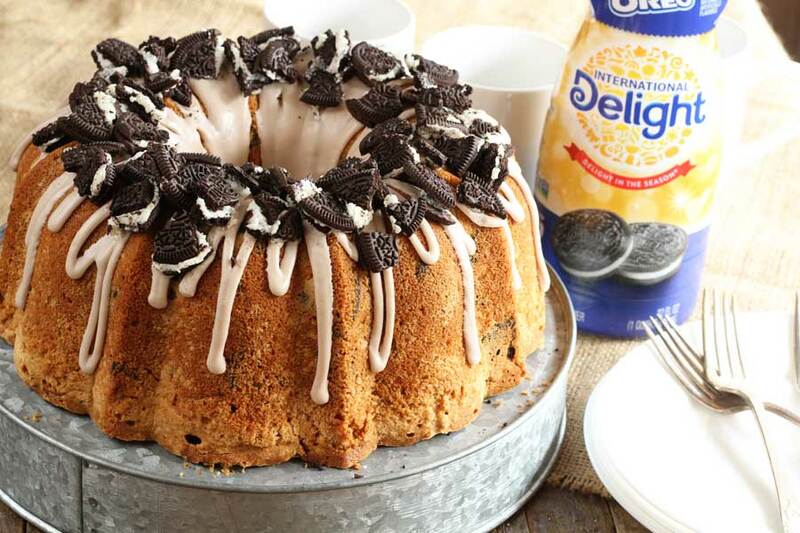 Fill the Bundt pan to within 1 inch of the top. Place the pan into a cold oven, and turn the oven on to 325°. Bake 1 hour to 1 hour and 10 minutes or until the cake pulls away from the sides of the pan and a toothpick inserted into the center comes out clean. Allow the cake to cool in the pan for about 10 minutes, then place a serving platter or plate over it and invert the cake onto the platter. Allow it to cool completely, then whisk together the powdered sugar and additional creamer to create the glaze. 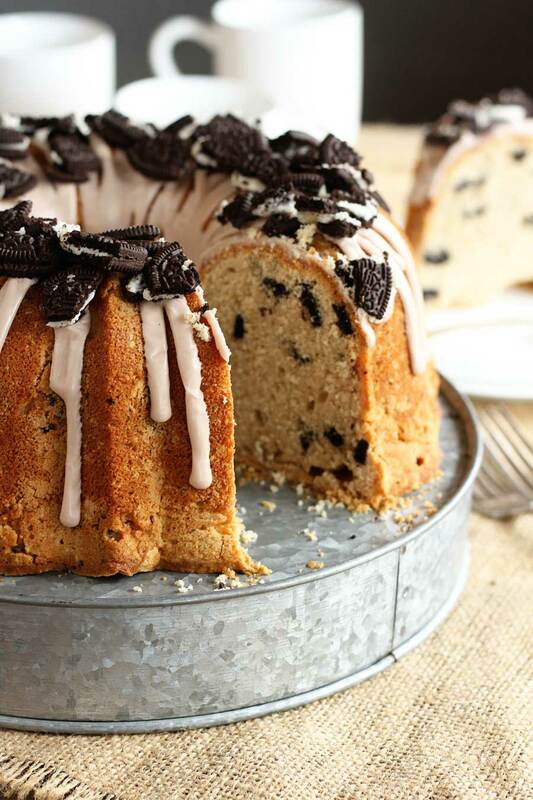 Drizzle over the cake and top with the remaining OREO cookie pieces. You can learn more about International Delight and get notified of exciting new flavors by signing up for their e-newsletter. 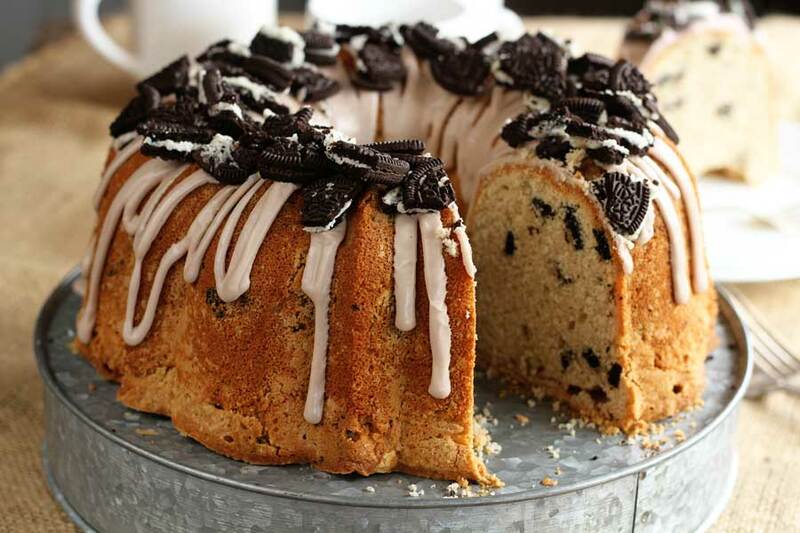 OMG…..this cake looks so good. I will have to make it, soon. And I will try the cold oven. Never done this before but, will give it a try. Thanks!! 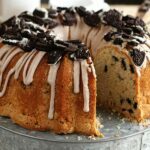 Can I use flavored Oreos in this recipe? I’ve not done that, but I can’t imagine why it wouldn’t work. Enjoy! Do you start timing the baking when you turn on the oven or when it comes up to temp? You should start timing when you put it in the cold oven. I have found it impossible to find the Oreo creamer in Pensacola Fl so I bought the Almond Joy since I had a package of Oreo’s with coconut filling. Turned out great. I noticed there is not any mention of baking soda, baking powder and salt…just want to make sure these ingredients are not needed before i make this cake. That’s correct. There is none in this recipe.